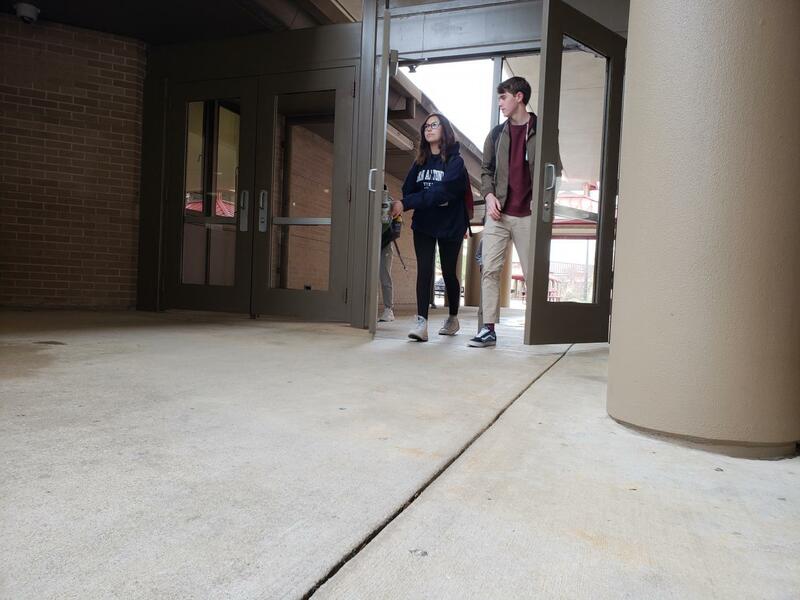 Freshmen Sophie Cabrera (left) and Preston Savoy (right) exit through the doors that had been vandalized on December 13th. The doors and windows at Bowie, now repaired, were fixed using donations from the Bowie PTSA's fundraiser. On the morning of Dec. 13, students and staff were welcomed to school with an estimated 75 to 100 broken windows in the fine arts and athletic halls. In the aftermath of this vandalism, the Parent-Student-Teacher Association (PTSA) stepped up and held a fund raiser for school repairs and improvements. The PTSA decided that the best course of action was to raise money for the school. Instead of relying on second-hand sources, the PTSA decided to run their own fundraiser. “We knew that if we created a fundraiser in lieu of a crowd-sourced fundraiser like GoFundMe, then we could guarantee that all the money raised would go to Bowie,” PTSA President Mia Scroggs said. With over $3,250 raised, the school benefited and still has $2,450 to dedicate to Build Up Bowie.